Live chat for sales. A technology that’s been around for years. Fully understood by a small proportion of marketers. Sadly, correctly optimised by even less. You can’t just stickchat on a website and expect magic to happen. Some people just add it as another support channel, managed by their usual support team…but that’s not the way to do things. Live chat is a whole other medium. It has its own set of rules and best practices. It needs a dedicated strategy to make it succeed. This is important for customer service and even more important for sales and lead generation (areas where chat can produce brilliant results that many digital marketers aren’t even aware of). What kind of brilliant results am I talking about? Well here at The Chat Shop we generate up to 50% more leads from existing customer traffic and the leads and conversions generated by our team have delivered over £20 million in revenue for our customers. We want to help you achieve these kind of results by using and optimising live chatcorrectly. So we’re teaming up with LiveChat to tell you exactly how to optimise for conversion. This post is part of a series by The Chat Shop and LiveChat on increasing online conversion and using chat as a sales enablement tool. Sidebar: LiveChat are the software suppliers that we work with to provide live chat outsourcing services to our customers. First off the bat from our team. How to target the right website visitors in order to help them convert. You spend a lot of time and money getting potential customers to your website to view your products. I’m guessing you’ve optimised for SEO, manage a few social channels and operate some PPC advertising. I bet in all of those channels you’re battling against at least a handful of competitors in order to get a good quantity of quality traffic. And then, once you have won some traffic for your site, these potential customers have a tendency of jumping around your site and between you are your competitors’ websites. This is the case for every industry. It’s so easy for consumers to research online that they’ll court a bunch of options during their decision journey. And they bounce around the funnel rather than gradually moving down in the pleasant fashion you’d love them to. Damn you internet, you really are a blessing and a curse. Consumers do the majority of their research and make most of their decisions before they would even think of reaching you for any advice or help in converting. Even if they want to buy, but can’t, there’s a strong possibility of them going to one of those competitors rather than having to reach out for help. Particularly true if they have to go way out of their way (such as changing communication channel – e.g. from your website to their email). But with live chat you can interact with potential customers before they reach that point. ‘That point’ is the thick black line in my poorly drawn funnel. The red is live chat engaging with people way before they’ve made their final decisions. You can find those that are interested but aren’t ready or able to convert. You can reach out before the conversion decision ultimatum. Help them before they hit those barriers – the “I’m not sure this is the right product”, “let me first see if I can find it elsewhere” or “it won’t let me click ‘buy’, I’m leaving” barriers. You can do all of this with proactive live chat. A preventative support technique that allows you to programme your software to invite visitors to chat based on their behaviour. Rather than waiting and hoping that they’ll come to you for help. Now on to how it’s done. First off you don’t want to be interacting with absolutely everyone. Some people are ready to take the final steps on their own (congrats, that’s when your buyer funnel has done its job properly) and some just aren’t interested in taking the next steps. You want to be interacting with people that are actually interested in what you offer, that just need a little help taking the next steps. 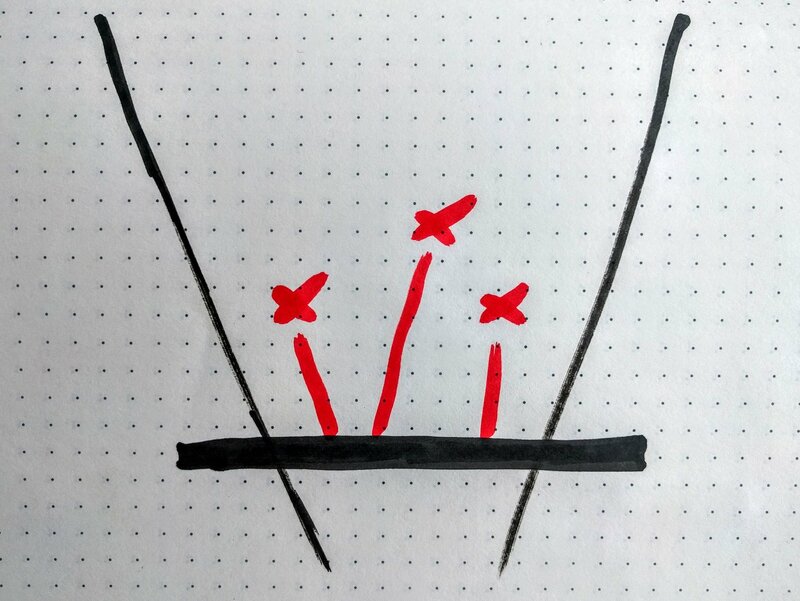 You want to make select interactions with people above that communication barrier line. Live chat is great…but you can’t completely flip a customer’s wants and needs. Don’t try and convert everyone. Deciding who to interact with depends on who would be considered an interested shopper on your website. If you’re selling a complicated product or service, a prospect might have to view a number of information pages before you could even dream of them making a decision. Consider setting up a proactive for people that have viewed 3+ information pages. More of an impulse product? Well you’ll definitely have to focus on something a little further down the funnel. Someone that has added a product to basket is definitely interested. Are you generating leads for a B2B product? Well there’s a much longer decision process here and someone that’s going to buy may have to visit a couple of times before they can be considered an interested buyer. Create some proactives that are targeted at returning visitors that have visited a few important pages. Sorry, no hard and fast rule on this I’m afraid. As with all applications of live chat, if you want to do live chat for sales you’ll need to optimise over time. Nobody likes being interrupted when they’re in the shopping zone. When you’re flying around the store, looking for the perfect products and throwing them into your basket…nothing can stop you. But then someone does stop you! A ‘helpful’ store assistant pops out of the woodwork and says “Can I help you with anything?” Ok, sure, they really are trying to be helpful (I think) but it’s just at the wrong time. A time when you clearly don’t need any kind of help (except a higher limit on your credit card maybe). When you’re using live chat for conversions you could interrupt potential customers in the same way – if you don’t interact at the right time. So be aware, don’t just engage the right people but engage those that look like they actually need help. Not just every poor soul because you’re too eager to get everyone to buy more stuff. That doesn’t work. When’s the right time? When someone you’ve identified as an interested consumer signals that they may need help in making the next step. You’ll need to stack instructions in your live chat code to satisfy both criteria. Again, this requires some studying of your website analytics data and optimisation over time. But we can offer some excellent starting points for when to interact. Start by looking at the average time on page for some of your checkout pages. Even better, filter your traffic based on people that do convert and people that don’t convert. If an interested visitor is on your checkout page longer than the average time a converting individual spends there, they might need some help. Send a chat invite based on this time on page metric. You can use a similar technique for product pages which provide a lot of detailed information. If the visitor has a lot to read before they can make a buying decision, it can be a good idea to make sure they have everything they need. But not too early remember…that’s why you should engage around the average time on page. Finally, an interested visitor that has been flicking between 2 similar product pages may be finding it hard to choose. Interact with them to provide some advice, rather than them giving up and going to a competitor because they think they’ll have clearer information. 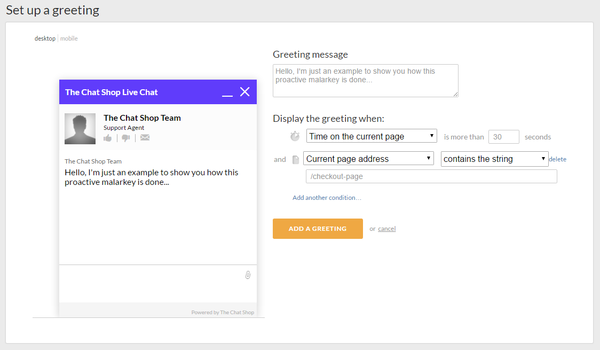 And these invites to chat don’t want to be generic messages such as “Can I help?”, they should be tailored based on the criteria you’ve used to set them up. Website visitors are much more likely to talk then. You need the right messages, at the right times, to the right people. Unfortunately there isn’t a magic ‘Optimise’ button that sorts all of this for you. Come on LiveChat developers, get it sorted…what are you playing at? Actually that’d put some of our consulting team out of a job. Second thoughts LiveChat developers, take your time on that magical invention. Optimising isn’t a 5 minute job and there aren’t any black and white guidelines for doing it perfectly. To get more conversions, by targeting the right people, will take time. Most live chat softwares provide plenty of data for you to analyse and learn from however…we’ll run you through a few things we use with LiveChat. 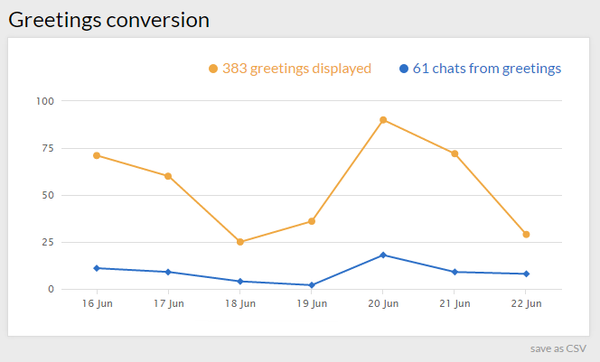 First up is the Greetings conversion report in the back end of LiveChat, under (you guessed it) the Reports header. Here you can dig into which of your proactive greetings are working and which aren’t. Conversion in this scenario means how many people are chatting when you invite them to do so with a proactive greeting. (Here’s an example of the conversion rate on a greeting for one of our smaller customers). Notice a proactive that is getting a very low engagement rate? Perhaps you’re firing it too early or the messaging isn’t as personalised as some of your other greetings. You’re not giving those interested visitors a reason to chat and get help in converting. You of course also want to see which proactives are actually helping customers and making them go “Yes, now I can click buy!” to your chat agents. To do this you’ll need to be tagging your chats when they are ‘Sales’ chats, ‘Lead’ chats, ‘Service’ chats and anything else you want to track. 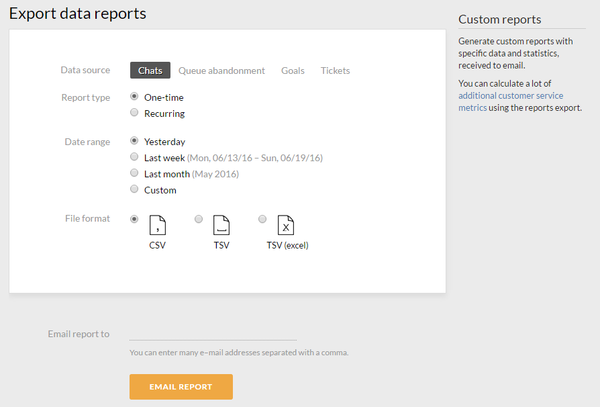 Then go to the CSV export in LiveChat’s Reports tab. Download the CSV and filter each proactive greeting, one at a time. You’ll be able to see which proactives are creating the right kind of conversations. You don’t just want people to chat, you also want to know that your strategy is able to produce conversions. If it isn’t showing conversions or just specific proactives aren’t, more adjustments are needed. You’ll also need to keep a close eye on your website analytics data as you keep chat optimised over time. Visitor behaviour never remains in a status quo, so don’t go thinking that proactives based on time on page will keep interacting at the perfect time. The perfect time can change. Live chat can produce some magical effects. It can dramatically increase sell rates on your website (along with improving lead generation and customer service, of course) but it does take a little work. Like every digital marketing channel, chat needs to be optimised over time. To make more conversions, you need to provide a quality service. To do that you need to do more than sit back and hope potential customers get in touch when they aren’t sure. You have to be proactive in your approach. Analyse the data, target the right website visitors and optimise over time. Look at how you can help more customers. Provide what they need to convert. Want to know more about The Chat Shop’s sales enablement programme? Get in touch so that we can convert 50% more visitors for you.